This recipe is paleo and vegan. Melt 2 tsp of coconut oil. Toss squash, cauliflower, apple and garlic in the oil. Spread the veggies, apple and garlic out on several baking sheets, making sure not to crowd them. Season with salt and pepper. Bake for 20 minutes in a 425 degree oven or until tender and beginning to brown. Add coconut milk, broth, cumin, cinnamon, nutmeg, cloves and honey to a large stock pot. Warm over medium heat. Add the squash, cauliflower, apple and garlic to the stock pot. Blend in batches in a blender or with an immersion blender until silky smooth. Saute onions and paprika in the remaining coconut oil over medium heat until transparent. 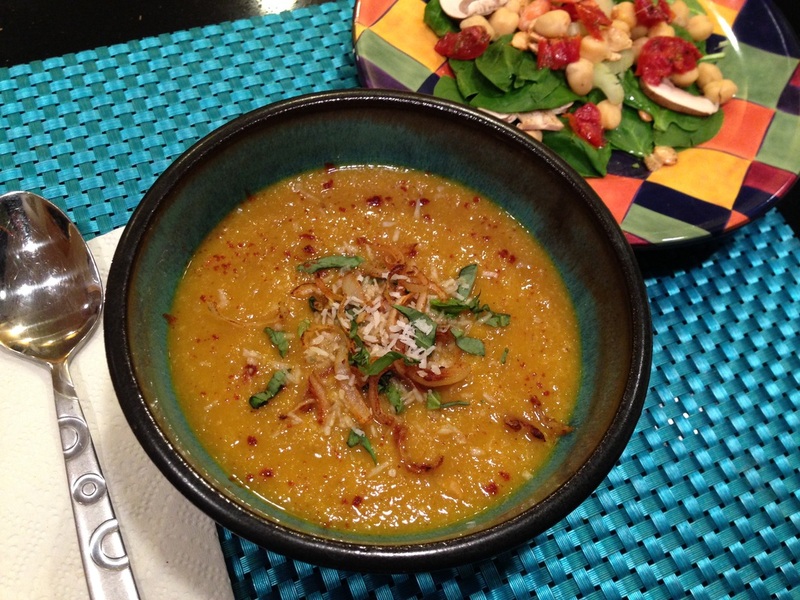 Garnish each bowl of soup with onions, basil, coconut flakes and a pinch of remaining paprika.